The Saudi National Anti-Corruption Commission is a governmental authority entrusted with protecting integrity and combating corruption in the Saudi Kingdom. It is also known as “Nazaha” which is an Arabic word meaning “integrity”. Nazaha aims to create a work environment of integrity, transparency, honesty, justice and equality in the bodies that fall within its jurisdiction or specialisation. Nazaha was established by Royal Order A/65, issued by His Highness King Abdullah bin Abdulaziz Al Saud on 18 March 2011. Article 1 of the Royal Order indicates that Nazaha is an entirely independent authority. It reports only to the King. Article 4 of the Royal Order establishes the functions of Nazaha to encompass all public sectors with no exceptions and the competence of Nazaha to combat financial and administrative corruption. The Saudi Council of Ministers approved a National Strategy for Protecting Integrity and Combating Corruption (“National Strategy”). The implementation of the National Strategy is assigned to Nazaha. The National Strategy states that corruption is an international phenomenon and defines corruption as “every act that threatens the public interest as well as any abuse of the civil service in order to earn an individual advantage”. The National Strategy adopts a broad view of corruption, which encompasses every act violating the rules and controls imposed by the system. The National Strategy justifies that broad view of corruption by recognising the several negative effects of corruption. For example, it recognises the negative effects on the process of development, the potential to divert the Kingdom from its targets, waste its resources, frustrate its process and weaken the effectiveness and efficiency of the systems. Examples of crimes falling within the above scope of corruption, pursuant to the National Strategy, are ‘bribery’, ‘making money out of power’, ‘misuse of authority’, ‘unlawful enrichment’, ‘manipulation’, ‘embezzlement’, ‘waste and misuse of public money’, ‘money laundering’, ‘accountancy crimes’, ‘forgery’, ‘forgery of money’ and ‘commercial fraud’. The National Strategy realises the international nature of corruption and that in many cases corruption can have cross border elements. It asserts that combating corruption is reinforced by international cooperation among countries. Such cooperation results in sustainable reformation programmes which should be appropriately implemented locally and internationally in order to reduce corruption. From this perspective, the Kingdom of Saudi Arabia signed the United Nations Convention against Corruption on 9 January 2004 and ratified the same on 29 April 2013. Nazaha is regulated by Ministerial Cabinet Regulation 165, which was issued on 2 May 2011. Article 1 of this regulation defines bodies that fall within Nazaha’s jurisdiction as all public entities in the Kingdom and companies in which the Kingdom owns no less than 25% of the capital. Article 2 of the regulation governing Nazaha, states that Nazaha is directly linked to the King and has a financially and administratively independent juridical personality. The same article indicates that Nazaha is a neutral body and that no one is entitled to interfere in its work. Ensuring the proper implementation of Public policies. Investigating bodies that fall within its jurisdiction to reveal financial and administrative corruption regarding Public Works Contracts, Operation and Maintenance Contracts and other contracts related to public interest. Nazaha undertakes necessary procedures to ensure compliance with the applicable Saudi rules and regulations. Referring financial and administrative corruption violations to regulatory or investigative authorities as the case may be. Nazaha also reports the violator to the head of the body in which he works. It is entitled to review the ongoing procedures and investigations regarding the cases it refers and may request the competent authorities to undertake any precautionary measures against those suspected of committing corruption offences. If Nazaha determines that a violation represents an institutional dimension for the body falling within Nazaha’s jurisdiction, it refers the matter to the Saudi King in order to decide as he may deem fit. Ensuring adherence and proper application of the Saudi National Strategy for Protecting Integrity and Combating Corruption. It follows up with the various authorities regarding execution of the National Strategy. Reviewing the recovery of funds and proceeds of corruption offences with the relevant authorities. Ensuring the proper implementation of the international treaties relating to corruption and to which the Saudi Kingdom is a party, in order to effectively execute the duties imposed therein. It also represents the Saudi kingdom in international venues relating to combating corruption. Nazaha collaborates with regional and international organizations concerned with combating corruption. Suggesting policies and regulations necessary to effectively combat corruption and performing regular revision to relevant regulations to decide on their sufficiency and means of improvements. In order to enable Nazaha to perform its duties, as detailed above, Ministerial Cabinet Regulation 165 states in Articles 4 and 5 that all relevant authorities shall collaborate with Nazaha to combat corruption. Such authorities shall provide Nazaha with any required financial and administrative information. Those authorities are to present any required documents to Nazaha. The structure set out in the Regulation has empowered Nazaha to perform its duties. Nazaha is able to positively influence the Saudi society and enhance transparency when dealing with public bodies. It was involved in numerous notable cases, and in some instances, it was able to aid the arrest of offenders in the act. For example, Nazaha helped in the arrest of a public official of the Saudi labour office while receiving a bribe amounting to SAR 120,000 (approximately AED 117,500). Since its establishment, Nazaha has had a great impact on the Saudi Kingdom and has reduced corruption levels. In January 2014, Nazaha released its annual report which revealed that within the course of 2013, it detected 306 cases of financial and/or administrative corruption by investigating 400 public projects. Nazaha has referred 30 cases to investigation authorities and Public Prosecution, 64 cases to the Minister of Health, 59 cases to the Minister of Municipal and Rural Affairs, 58 cases to the Minister of Education and 30 cases to the Ministry of Water and Electricity. Statistics show that Nazaha deals with more than 80 corruption complaints daily. Those complaints are being dealt with immediately by taking the appropriate actions. It conducts unexpected visits to bodies that fall within its jurisdiction in order to reveal instances of corruption. Nazaha uses the aid of women employees in order to reveal corruption that takes place in bodies that only deal with women. Nazaha even reported uncooperative Ministers and governmental authorities to His Highness King Abdullah bin Abdulaziz Al Saud. The above indicates how forcefully the Kingdom of Saudi Arabia deals with corruption and how eager it is to eradicate this phenomenon. That approach has made the Saudi Kingdom the 63rd country on the corruption perceptions index, compiled by Transparency International (Transparency International is an internationally recognized non-governmental organization that monitors and publicises corporate and political corruption in international development). Although Nazaha publically disapproved the ranking of the Saudi Kingdom on the corruption index and believes that the ranking does not reflect the actual levels of transparency in the Kingdom, arguing that the country should have got a better ranking, it is noteworthy that the kingdom was promoted three ranks in the 2013 index. The president of Nazaha has encouraged all public bodies in the Saudi Kingdom to periodically provide Nazaha with statistics and information in order for Nazaha to be able to demonstrate its true ranking in the 2014 index. 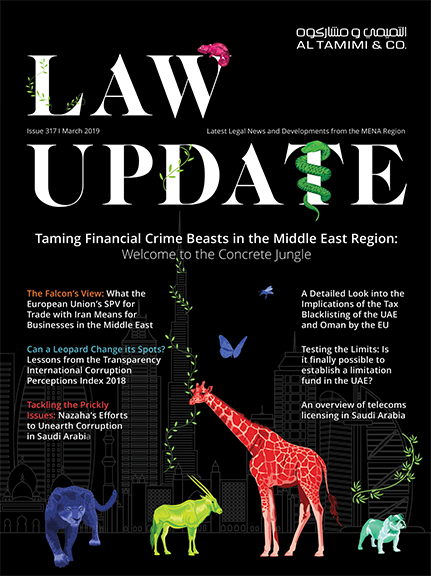 With offices in 7 countries across the Middle East, Al Tamimi & Company is well-placed to advise clients on matters related to anti-corruption and financial crime, not just in the United Arab Emirates, but throughout the Middle East region. Al Tamimi & Company’s Financial Crime Department is regularly instructed in complex, multi-jurisdictional matters related to all areas of financial crime. For any queries relating to financial crime in the Middle East, contact the Head of Al Tamimi’s Financial Crime Department, Khalid Al Hamrani – k.hamrani@tamimi.com.